Give Your Guests the Best Kid's Party Favors in NY! Settle for nothing but the best when it comes to planning your kid's next birthday party. Throwing an awesome party means finding some awesome NY party favors and supplies! Decorate your kid's party and give out the coolest party favors from these top party supply companies in NY. KidsParties.Party is another great resource that features services that provide kids party favors in NY. Party Favors for Every Occasion in NY! From invitations to goodie bag gifts, Forever More has it all when it comes to party favors and supplies in NY. Not only do they have everything to make your kid's birthday party look good, but they also offer top-notch gifts to give to each guest when they leave. Forever More's wide selection includes piggy banks, photo frames, toys, personalized gifts, clothing, and much more. Your kid's party will be a definite success with Forever More! They Can Personalize your Party Favors! From party supplies to goodie bag favors, It's a Favor has every type of party favor you could ever want for your kid's birthday party. Choose between a long list of personalized favor for your party guests, and put a smile on their faces as they leave your child's fun-filled party. It will be hard to choose which favors to choose with their large variety, including picture frames, gumball machines, personalized gifts, ribbons, gift bags, and much more! Party Favors the Kids will Love in NY! As a stylish, trendy and fun party favor service in NY, Anya Tyler Favors is a one-stop shop when it comes to party favors and supplies. They offer unique party favors for all ages and events, from a baby's first birthday to a sweet 16. Sure to have just what you're looking for, Anya Tyler Favors has it all! 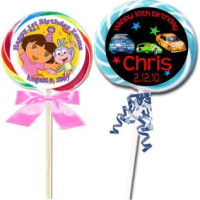 Their full stock includes personalized items such as lollipops, chocolate bars, gumball machines, birthday cookies, invitations, water bottles, gift bags, mints, and more. From Balloons to Party Gifts in NY! This party super store has everything you'll need for your kid's birthday party, from party supplies to decorations. 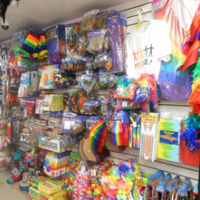 Village Party Store has something for everyone, with its themed party supplies and balloons. Also offering ribbons, small gifts, paper and plastic plates and utensils, this is a one-stop shop for your kid's birthday party! Village Party Store's selection includes party supplies with Disney princess themes, Cars themes, Scooby Doo themes, Star Wars themes, Toy Story themes, and much more. From Elmo to Justin Beiber Themes Here in NY! 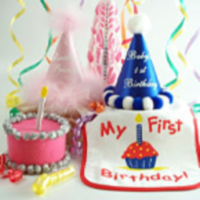 No matter what age your kid is turning, you can find top-notch party supplies and favors at Party Glitters! 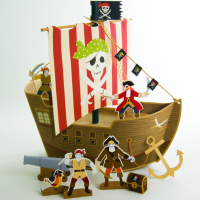 With a variety of party themes, you are sure to find something that your kid will absolutely love. 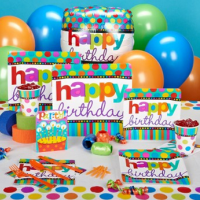 Find party supplies like plates, cups, invitations, balloons, napkins, pinatas, gift bags, and more here! Party Glitters not only has a vast stock of party supplies, but they also have a large variety of themes, from young to old, inclusing Elmo, Hello Kitty, Dora, SpongeBob, Toy Story, Spiderman, and much more. Favors for any Age in NY! You can find any type of party favor for your kid's birthday party at Favors & Flowers! 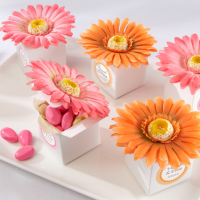 Whether you're looking for a cute party favor for your daughter's sweet sixteen, or fun kiddie party favors, you can find it all here. Not only can you get some memorable party goodie bag favors, but you can also get centerpieces, wall decals, and other types of decorations. You will spend hours browsing through their full list of party favors, looking for just the right one. Some of the options include lip balm, ice cream scoops, gift bags, candy favors, and more! 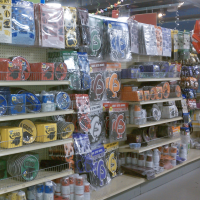 Affordable Party Supplies & Decorations in NY! 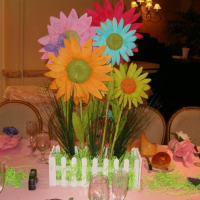 Not only can you get some beautiful balloon sculptures, columns, arches and centerpieces, but you can get a bunch of other types of party decorations and favors at Balloons Plus! Get everything you need to make your kid's birthday party look fun and festive, including candelabras, back drops, marquis, florals, draping, and more. The birthday kid can choose between a vast variety of party themes, including fairytale, pretty in pink, tropical, Paris, the 80's, masquerade, sports, wrestling, race cars, and more - ask about custom themes! Have a Themed Kid's Birthday Party in NY! With something for everyone, the Party Warehouse is a one-stop shop for your kid's birthday party needs. You can find party favors, supplies, decorations, invitations, rentals, balloons, and whatever else a kid's party entails. Get your invitations custom printed, and order a custom balloon bouquet here! To make your kid's party unique, choose one of their many party themes, including farm animals, Harry Potter, sports, Barbie, Disney princesses, super heroes, Barney, and much more.